Employment verifications are one of many screening tools employers use to determine an individual’s suitability for employment. Considering as many as 40% of all resumes contain some type of inaccuracy or outright misrepresentation, verifying a candidate’s past makes a whole lot of sense. Employment verifications range from employment history verifications and employment reference checks to education verifications and supervisor interviews. 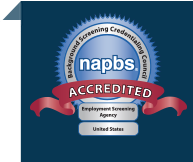 The National Association of Professional Background Screeners (NAPBS) recommends four ways to increase the value of your pre-employment background verifications. These tips apply to employers who rely on a background screening company for such services. 1. Gather as much information as possible for your employment verification request. The more information you gather about your applicant’s employment or education history, including address information and full contact information for references, the more accurate and timely your results will be. Ask your applicant for previous or alternate names held during the timeframe being verified. A common problem in verifying female candidates is records that exist under the maiden name. To boost the accuracy of this information, your employment screening provider should have an online ordering system that integrates with your existing XML-compatible applicant tracking system. This avoids duplicate entries and eases the information-gathering process, lending greater accuracy to the process. 2. Get a signed consent form. Many verification sources require the physical signature of the applicant in order for data to be retrieved by your screening provider. For example, universities and other educational institutions almost always ask for a real signature (as opposed to a check-box electronic signature) in order to complete the verification. We are one of a small handful of background screening providers to integrate signature technology into our online ordering system. Applicants can easily provide a physical “wet” signature using a mouse-enabled web-based signature capture system. 3. Keep the verification job-related. If a simple verification of employment start and end dates is enough to satisfy your job requirements, there is no need to request more data from your background screening provider. The more sensitive or customized data you request, typically the more expensive and time-consuming the process becomes. Stick to only what you need. We can help you determine the most appropriate level of data for your particular needs. Just ask. The world of verifications is fraught with complexity and competing priorities. Past employers, schools, and references are busy and unfortunately, returning verification information is not typically at the top of their priority list. It may take several attempts before a verification can be established and sometimes it is even impossible to accomplish. Our verification experts know how to obtain that hard-to-get verification data. Our researchers have years of experience and deep training in techniques and extensive understanding of the resources necessary to accomplish your verification goals. Your provider should have the same. If not, look elsewhere.